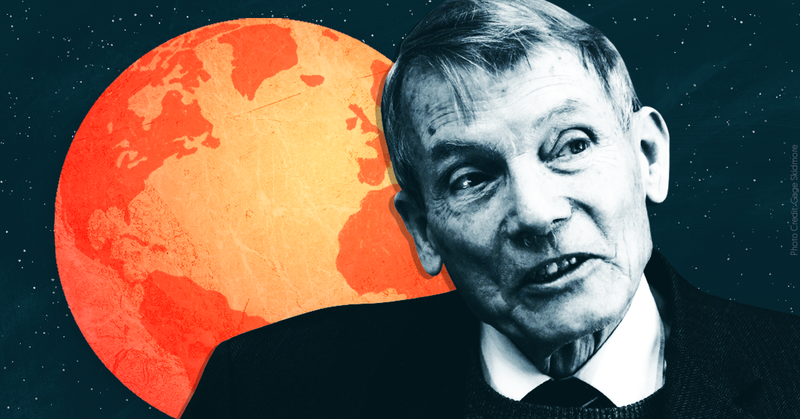 President Donald Trump may put climate-denying physicist  William Happer at the head of a new Presidential Committee on Climate Security, according to a recent Washington Post article . The proposed panel would evaluate whether climate change poses a national security threat. (It  does .) Happer, an emeritus professor at Princeton University and veteran of the George H.W. Bush administration, currently serves  as Trump's deputy assistant for emerging technologies on the National Security Council. It’s not hard to understand why Trump would pick Happer to head his panel: He's a credentialed scientist who denies  that carbon dioxide emissions are causing extensive global warming and has testified  before Congress about the need for a government-mandated panel to review climate science, which he said is “far from 'settled. '” Though he's a physicist, Happer has never published any peer-reviewed research  on climate change. Happer has multiple connections to the Koch brothers and fossil fuel companies. He served as adjunct scholar at the Cato Institute , which was founded  by Charles Koch, and has been  affiliated  with The Heartland Institute, a climate-denial  group that has received funding  from the Charles G. Koch Foundation. Happer was on the board of directors  at the ExxonMobil-funded  George Marshall Institute, and he co-founded its successor , the CO2 Coalition. He has also disclosed  that Peabody Coal paid him to testify at a hearing of the Minnesota Public Utilities Commission. A 2015 Greenpeace investigation  exposed Happer’s willingness to work even more directly for fossil fuel companies. Corresponding over email with a Greenpeace staffer who was posing as an oil company consultant, Happer agreed to write about the alleged benefits of increased carbon emissions at the behest of a fictional Middle Eastern oil company and to not disclose the company's payment to his group, the CO2 Coalition. In a 2018 video  for Prager University , a right-wing propaganda outlet, Happer attacked climate science models as unpredictable while minimizing the role CO2 plays in global warming. Despite what Happer says, the science is clear: Human-caused CO2 emissions are the primary driver  of climate change, climate change is already having negative effects in the U.S. and around the world, and its catastrophic impacts will intensify in coming years. This has been confirmed by recent major reports from teams of respected scientists at the U.N. Intergovernmental Panel on Climate Change  and in the U.S. government . Happer’s eccentric and incorrect views on climate science should disqualify him from serving on the National Security Council, not to mention a White House panel on climate change. But as long as he provides Trump with cover to engage in climate denial and justify  rollbacks of environmental protections , Happer will likely continue to have a loud voice in the Trump administration -- no matter how many ludicrous statements he utters.